Grandma & Grandad UK arrived safely yesterday afternoon. And we slotted back right back into conversation as if we only saw them last week, not last year or two years ago. Happy sigh. I don't really believe in telepathy. Far from it. But how else do you explain Grandma & Grandad bringing a very excited 4-year old his absolute heart's desire and they didn't even know that it was?! I'm talking about a little boy who has been talking for months about being Darth Vader for his Star Wars dress up party for his 5th birthday - which is still SIX months away. With this comes very frequent requests to get a Darth Vader dress up costume so he can be the real deal. And guess what got packed into the English suitcases and brought half-way around the world? Yuh-huh!! When I first saw the costume, my first thought was 'oh Mark must have told his parents about Noah wanting to be Darth Vader'. Meanwhile, he was thinking the same of me. But very quickly we realised that it was a complete fluke, and they had spotted an absolute bargain at Marks & Spencers. Originally priced at 20 pounds, they had waited and waited through the sales until it came down to an incredible 3 pounds - that's $6 NZD. I.N.C.R.E.D.I.B.L.E. Especially when you think that a similar costume here would be at least $50. And they nearly didn't buy it as they weren't sure if it would be too scary for Noah?! He hasn't taken it off since he got it although he hasn't asked to sleep in it.......yet. It even makes the real Darth Vader deep breathing noise. Amazing coincidence hey! And I'm going to be taking lots of leaves out of Simone's (the Queen of Parties) book using some of her ideas when it comes to planning the big Star Wars Party. We've been holding out and holding out to keep the old laptop going and going. But with less than a 50GB hard drive and only 750MB RAM which just about qualifies as an Ark these days, I've had more and more frustrating moments over the past few months where Mr. Laptop hasn't even been able to cope with even 2 applications open at one time. A relatively quick photo editing job can drag on for hours..... and the heat its been generating has been somewhat concerning...have half expected it to blow up at any minute. So, yes we've splurged a little. But its an investment for the long term. Albeit a funky, shiny red one. Oo la la. So if I'm a bit absent these next few days, it's cos I'm trying to get all the old onto the new, downloading all the apps again...yawn....but it's gotta be done! We loaned our other car to our good friends Sally & Olly for a few days when theirs kept mysteriously breaking down. Olly returned the car the other night, weighed down by a box carrying Russian Fudge. I am a complete sucker for it. Seriously. And Sally's Russian fudge is the best ever. Truly. I dare you to find a yummier version! I think I ate about 10 pieces in that one night. Must.stop.eating.it. Sometimes its the small things. This little guy was completely made up by a free flag Grandma picked up at the Vellux Ocean Race party down on the waterfront today. Don't ya think? Trying on his shiny new top and hat from his mum and dad. My thoughts have been with the Treacy family all this week. As I mentioned on Monday,a wonderful girl whose blog I read (Jaz) had to have brain surgery on Monday. Things didn't go to plan during the operation, and as a result it looks like Jaz will have a longer road to recovery than anyone expected. But God is an amazing God, and the many prayers that have been sent on High on her behalf this week are sure working, with some really great progress being made especially in the last day. You can read Jaz's story here, which is lately being written beautifully by her husband Mark. He is doing an amazing job being a wonderful daddy to their three beautiful girls who are really missing their mum as well as being Jaz's rock during this difficult time. Know that the prayers continue from here. 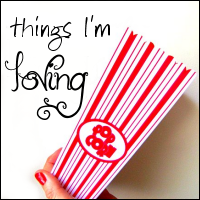 I'm linking up to Paisley Jade's new Things I'm loving linky this week too. that darth pic is SOOOO cute! I LOLd!! Grandparents are awesome, i hope you are going out for lots of 'me' time!! I love your list! That Darth vader suit is super cool and what a deal alright! Your drug lord cracked me up... and fudge is too dangerous for me (one of my major weaknesses). Enjoy your family visiting!!! Aww so cool about that darth vader costume! 3 pounds!!!! Unbelievable. So chuffed I got a mention too! what an awesome costume!! and i love bargins like that wow!! What a great list! I love having family from over the sea visit and that Darth Vadar costume- well, it's FABULOUS! Such a lovely post and awesome to enjoy time with the Grandparents. The costume is a fabulous bargain! I have a 'Stormtrooper' and 'Anakin' costume you are free to borrow (children's 3-6) if you need for the party. Charlotte had a 'Stars Wars' party for her 6th Birthday - http://www.chezlee.co.nz/2009/06/star-wars-extravaganza/ - let me know if you need anything. Oh love the Darth vader suit! And visitors from overseas, wonderful! I too and a COMPLETE sucker for Russian fudge, LOVE the stuff! Ive been following Jaz's blog too, lots of prayers going her way. Love your new banner too!! !